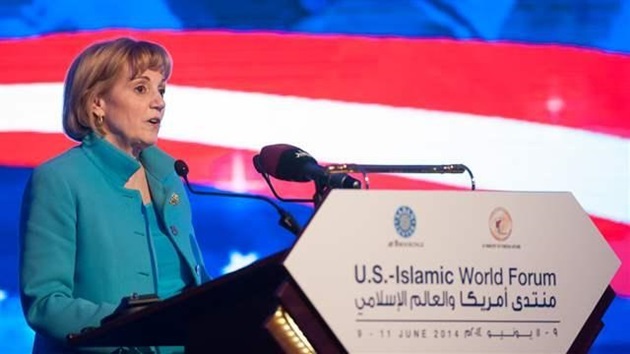 Based on various sources, the GMBDW judges this year’s US-Islamic World Forum to be a sign of the complete collapse of US policy toward the Global Muslim Brotherhood. For the first time since we began reporting on the event in 2008, the Forum program shows no identifiable leaders of the Global Muslim Brotherhood from outside the US present at the event, continuing the trend from last year when we reported that only Jasser Auda, a close associate of Youssef Qaradawi, was invited. As we reported in May 2012, the U.S.-Islamic World Forum at that time featured a much broader range of Global Muslim Brotherhood leaders including Tariq Ramadan, son-in-law of the founder of the Egyptian Muslim Brotherhood, and Rachid Ghannouchi head of the Muslim Brotherhood in Tunisia. Also featured in 2012 were several members of the Libyan and Egyptian Muslim Brotherhood including Essam el-Haddad an Egyptian Brotherhood leader who was a former advisor to now deposed Egyptian President Mohamed Morsi. The event in previous years had also been a veritable galaxy of Global Muslim Brotherhood stars. Also missing from this year’s proceedings were notable Brotherhood apologists such as Georgetown professor John Esposito, likely to busy offering a defense of the Brotherhood to the UK Parliament, and former Obama administration faith advisor Dahlia Mogahed whose family ties to the Brotherhood have been documented by the GMBDW. The GMBDW notes that given current events in Iraq and the apparent collapse of more US policy, it takes a large degree of hubris to imply that the Gulf States (the forum host Qatar notably excepted), in their opposition to the Muslim Brotherhood are making life difficult for the US.